Direct from its sold-out run at the Menier Chocolate Factory, Tony and Olivier award-winning director Trevor Nunns exuberant revival (The Telegraph) of the classic Broadway musical Fiddler on the Roof transfers to the West End for a strictly limited run. The Playhouse Theatre will be specially transformed into an immersive space for this shiveringly intimate chamber musical about family (The Times). Old traditions and young love collide in this joyous and timely celebration of life. Tevyes daughters unexpected choice of husbands opens his heart to new possibilities, as his close-knit community also feel winds of change blowing through their tiny village. 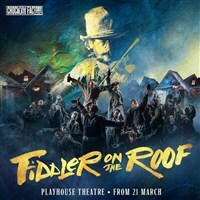 Featuring the iconic score including Tradition, Matchmaker, Matchmaker, Sunrise, Sunset and If I Were a Rich Man, and packed with Jerome Robbins original Tony award-winning choreography, Fiddler on the Roof bursts from the stage (Financial Times), bringing new life to one of the most beloved musicals of all time.